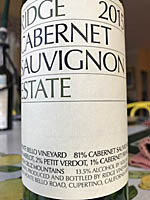 Grape Variety: Cabernet Sauvignon blend – 81% Cabernet Sauvignon, 16% Merlot, 2% Petit Verdot and 1% Cabernet Franc. 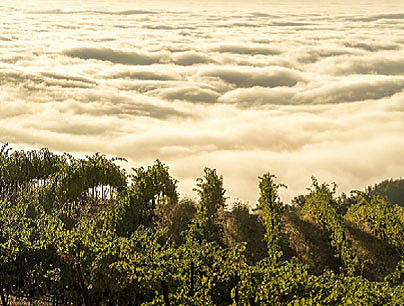 Geographic Appellation,, Region, Country: Monte Bello vineyard; North coast California. Purchased From: Ridge Vineyards; Monte Bello Vineyard tasting room; Cupertino, California. Paired With: Filet mignon with onion and Madeira wine sauce, Yukon Gold mashed potatoes and corn on the cob (from the garden). Opened one hour before drinking. Just clear, dark garnet color with a lighter purple rim. WOW, wonderful blackberry, damp earth, tobacco and fresh cut cedar aromas with occasional whiffs of tobacco. Super smooth entry, fruity, mouth puckering dry, medium to full (closer to medium) body and a 200-grit texture. Strong current, blackberry and cherry flavors, plenty of acidity and silky tannins with a perfect grip. A long fruity finish that was filled with peppery spice and oregano. Simply spectacular…it just had everything a good California Cab should have. It was a big powerful “New World” wine that has seen lots of California sunshine, but it was so good paired with the filet mignon and could only be called sensuous sipping after the dinner with dark chocolate!!! 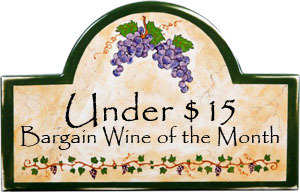 Succulent and elegant California Cabernet Sauvignon blend that we thought was FANTASTIC and it shouldn’t be overlooked that Ridge isn’t charging crazy Napa prices for a bottle of this delicious wine. 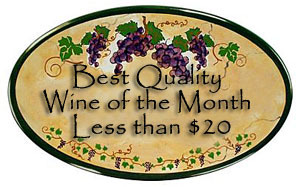 See also: Our reviews of other Ridge Vineyards wines.